On this Saturday mid-morning, I’m enjoying the most recent post at the Wrong Way Write Way Blog by Tom Hitt. The retired school teacher blogs on Typewriters, writing and is adding stamp collecting to his interests. From his Twitter profile: “Writing poetry and observing our world. Typewriters, yeah! Love to cook and love to eat. Bird-watching and cycling. Addicted to humor.” He is based in Pennsylvania. His Wrong Way Write Way blog post Stamp Gifts post finds me smiling recalling going through a similar box of stamps after attending my first local stamp club meeting over three years ago on Shoe Box Stamps. You’ll want to read his Typewriters? HA! Stamps Will Bury You, “This is the condition my condition is in” from July 24, 2018 . 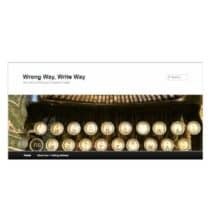 Both the Wrong Way Write Way Blog, and AnchoredScraps blog feeds are included at The Typosphere on The Mighty Blogroll. It is a delight and honor to be among this typewriting enthusiasts community! The Typosphere banner – to view The Mighty Blogroll it is on the right side of the page. For the pen pal in me, I love that Tom has an actual snail mail address listing to encourage letter writing to him at his About page. While we both follow each other on Twitter, today will be my first time to write an actual letter to him, it will include a print of today’s post. In closing, I’m going to have to find out if any of my Pen Pals in Pennsylvania already know him. My sincere thanks to Tom for continuing to share his posts and sharing his enthusiasm with stamp collecting!